Morena Baccarin Cast in "Gotham"
sucked into the game, into the world of Tabletop RPGs. The comic starts off in the the 90s, with five friends introduced to a new game. Sol designs the game and explains it’s a better version of Dungeons and Dragons. They are sucked into a fantasy world which grows and creates complications. Five of them escape but the escape comes at a cost. The youngest loses her arm. The Grandmaster, Sol, who led them there, is pulled back into the world. Decades later, as adults, one of them receives their friend’s bloody D20. In a brief moment of fear, he seeks to destroy it. He stops, knowing destroying the die is not his decision to make. They agree to meet and discuss the fate of the D20. This is not a smart idea. They return to the fantasy world they left behind look ago. Their families have no knowledge of their whereabouts. sides the die has.) Chuck, a Fool, throws a D6 with two sixes. He is a simpler knights who cheat luck. Matt is a knight on the emotional spectrum brandishing a D8. His power comes from feeling extreme emotions linked to his class. god who will listen. Sol, the Grandmaster, holds the legendary D20. His character is like a wizard. 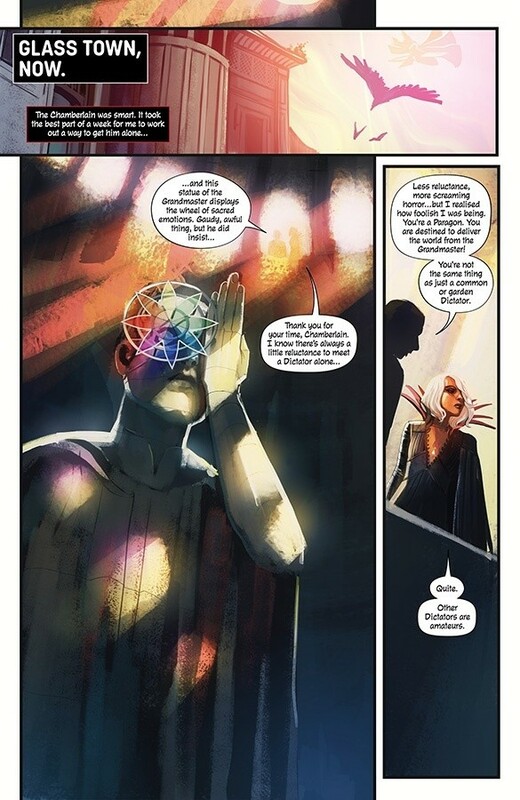 The issue opens up with a cold and calculating plan to force out their new game master. Sol designed a long epic quest that would take months or years to complete. The protagonists decide on a more efficient approach. They will destroy his beloved Glass Town. They take all of the citizens to a church for protection, allowing the town to be destroyed. Sol, unable to handle this unnecessary destruction, appears, furious at them for refusing to play by his rules. They accomplish their end goal but the tables turn when they began the ritual to take them home. The tension rises when some are hesitant to commit to a homecoming. If that’s not enough, an ugly truth elevates the stakes. The characters real priorities appear, and multiple betrayals are occuring. It is amazing! malicious things are done to the people who live there, sometimes out of boredom. The series refuses to shy away from the ethics of roleplaying. Buy! 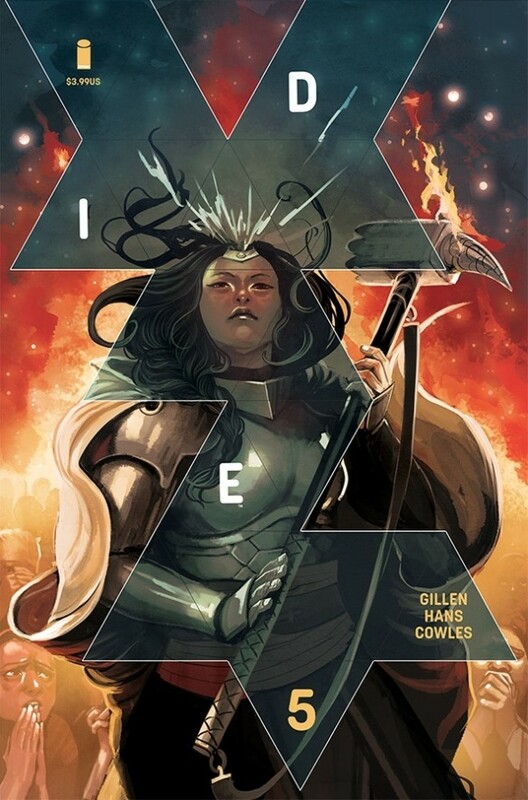 This is another classic series from Kieron Gillen, If you love RPGs, fantasy, or just a good story with a lot of twists and questionable ethics, then Die is the series for you. And with the hiatus after the first arc, now is the perfect time to catch up and dive in. My name is Kristopher Kuzeff. I live in Indianapolis, IN, with my perfect wife, Brianda. I work for a mobility company, basically working as IT for people's work phones. I love books of all kinds, and I will unapologetically rock out to Linkin Park and Hamilton. You can reach me at krisvkuzeff@gmail.com.